Maintaining a clean office is something you can’t do without if you are an employer, unless you run a garuge or a workshop where dirt is part and parcel of your work. With a normal office setup, you have no choice but to have your working space cleaned and maintained on a regular basis. That way, your employers can be comfortable and highly productive. Your clients on the other hand can feel welcome and have no problems seeking your services from time to time. Well, there is always a price one has to pay to end up with a clean office on a daily basis. 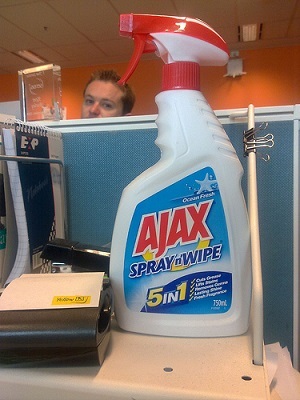 You have to hire professional office cleaners. It also means you have to set aside time for cleaners to clean. But hiring professional cleaners will always be a worthwhile price to pay so that you can enjoy a clean working environment and build a good reputation for your business, especially when your clients visit. But there are yet other ‘prices’ you may have to put up with if your cleaners don’t observe basic office cleaning etiquette. With that in mind, ensure that your cleaners observe the following office cleaning etiquette rules. Don’t you just hate it when a cleaner shows up when you are in the middle of a meeting and insists on cleaning while the meeting is underway? This happens mostly when one hasn’t come up with a schedule on when the office should be cleaned. The obvious solution in this case is to come up with a schedule that your cleaners can observe. This doesn’t even sound like an etiquette rule, but it is. The fact that it is deeply rooted to health factors does not in any way make it a lesser rule. People are allergic to different things. Others find some scents off putting. Find out if any of your employees is allergic to the cleaning solutions used by your cleaners. Find out too if there is an employee who doesn’t like the scent of the cleaning products used by your cleaners. Remember a happy staff can go a long way to help your reach your business ROI goals. They can also relate well and make you a happy employer. With that in mind, do not let something trivial like the scent of the cleaning products used in the office get in the way of your employee’s work. Wet floors and stair cases are always slippery. That means they can be dangerous to you, your employees and clients. Your cleaners should always use ‘slippery floor’ warning signs to remind anyone walking around to be cautious. Some cleaning products can also be hazardous. This happens when pest control and mould remediation procedures are underway. The best you can do in such instances is to remind your employees through stickers and warning signs to keep off from areas that have to be remediated or fumigated. The washrooms, the reception, the kitchenette and the conference room are all important areas in any modern office setting. Some areas are however much more important than others. They have to be given top priories by your cleaner. The washroom, the reception and the conference room should always be prioritized. Make this clear to your cleaners to avoid small embarrassments that can cost you a client because like they say, impressions matter a lot in business. Nothing is as annoying as a noisy vacuum cleaner running in the next office when you want to concentrate on your work. It gets worse if you are on the phone. You can’t hear anything. Talk to the management of the cleaning company that serves your office. Request them to use noiseless cleaning gadgets and procedures. It is possible to have your employee having conflicts with a staff from the office cleaning service provider cleaning your office. This is unfortunate but then again, it is normal. People are after all, different. Some don’t get along with others well, some do. So if by any chance there is a feud brewing between the aforementioned parties, find a solution at your earliest convenience. Such kind of conflicts can tarnish your company’s reputation, if not solved amicably and on time. If for one reason or another you suspect or find out that the feud results from misconduct by the cleaning staff, lodge a complaint with the management of the office cleaning service provider and request another cleaner. This has nothing to do with cleaning but everything to do with etiquette. Insist on cleaners wearing name tags and lanyards, especially if they do not put on a uniform. That way, your clients will always have an easy time distinguishing your staff from cleaners. Unscrupulous cleaners masquerading as your employees can also have a hard time trying to impersonate your employees in different scenarios. So, make sure that the name tags are always worn right by both your employees and the cleaning staff.